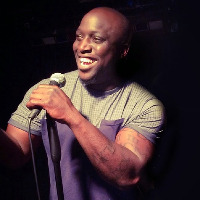 London based Emmanuel Sonubi has only been on the comedy circuit for what fills like five minutes and heâ€™s already garnering himself a reputation as â€œTHE one to watch out for"
Ex-bouncer and failed contestant of â€˜The Worlds Strongest Manâ€™ Emmanuel was born and bred in the East End of London where he extracts most of his hilarious interactions with the vibrant cockneys and reprobates he has encountered. Now a father of two the soon to be headliner has a wealth of material of playing pranks with his kids as well as his awful parenting skills. Do you promote/manage EMMANUEL SONUBI? Login to our free Promotion Centre to update these details.